Hyundai Motor Company, one of FIFA’s Official Partners, presents FIFA’s Hyundai Best Young Player Award (BYPA) to Thomas Müller, the German national football team’s midfielder who helped his team finish third during the 2010 FIFA World Cup™ in South Africa by scoring five goals, with three assists. Müller’s pace, vision and exceptional technical ability mesmerized football fans around the world during the tournament. He beat fellow nominees Giovani dos Santos (Mexico) and Andre Ayew (Ghana) to receive the coveted award. “As a committed supporter of football, we are delighted to join FIFA to support this special prize which has been a feature of the FIFA World Cups since 1958,” Werner H. Frey, Managing Director of Hyundai Motor Deutschland GmbH, said today at the handover ceremony. “We feel that the young and dynamic nature of this award fits perfectly with our brand,” he added. Oliver Takahashi, FIFA head of Marketing Alliances and Event Management, presented the Hyundai BYPA trophy and the Hyundai ix35 compact sport utility vehicle (known as Tucson in some markets) to Thomas Müller. Müller is the third German national football player to receive the award since Franz Beckenbauer received it in 1966 and Lukas Podolski in 2006. “It is a great pleasure for FIFA and our partner Hyundai Motor Company to officially recognize Thomas Müller as the brightest young star of the 2010 FIFA World Cup™. His five goals and outstanding displays for Germany make him a very worthy recipient of this award. We would like to thank Hyundai for their support of the Best Young Player Award which continues the proud tradition of recognizing exciting talent at the FIFA World Cup™,” Takahashi said. 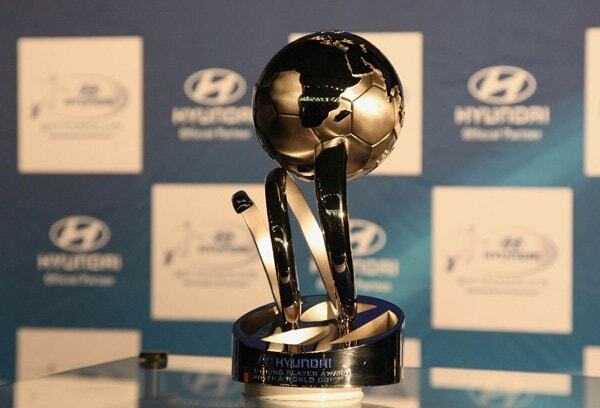 The Hyundai BYPA is one of FIFA’s official awards recognizing the most outstanding FIFA World Cup™ performances by footballers aged under 21 and is selected by the Technical Study Group, a FIFA-appointed group of top football coaches and analysts. Judges look for certain technical qualities such as skill, style and charisma but also other important factors such as a sense of fair play and a genuine enthusiasm for the game. Hyundai is extremely proud of its twelve-year strong association with FIFA, during which the company has demonstrated itself to be a reliable and effective partner by serving as the official automotive supplier to all FIFA-sanctioned events around the world. Hyundai is currently esteemed as one of FIFA’s top partners and has extended its strategic sponsorship agreement with FIFA to cover 2014 FIFA World Cup™ in Brazil, 2018 FIFA World Cup™ in Russia and 2022 FIFA World Cup™ in Qatar. Photo Caption: Thomas Müller (left) and Oliver Takahashi (right) posing in front of Hyundai ix35 compact SUV.